1. Preheat the oven to 180°C, gas mark 4. Place the tomatoes, cut side up on a large baking tray and scatter over the garlic, half the basil and the pine nuts. Then drizzle over 2 tbsp oil, season and bake for 25-30 minutes. 2. Place the bread slices on another large baking tray, and brush with the remaining oil, season and bake on a lower shelf for the last 20 minutes of the tomatoes’ cooking time until crispy and golden. 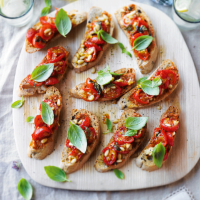 3.Spread the bread with the pesto, top with the tomatoes, drizzle with the leftover juices. Then sprinkle over the remaining basil and serve. This recipe was first published in Tue Aug 18 12:38:00 BST 2015.